Clarence Cabreros, a young local father of a six year-old girl, suffered a stroke that had the potential to change his life forever. After receiving the immediate care he needed, he was admitted to the Acute Rehabilitation Center to work on regaining the everyday abilities necessary to work and care for his family. While the accelerated work that goes on at the Acute Rehabilitation Center is physically and mentally demanding, Clarence enjoyed the comfort of seeing his family daily throughout his stay. “The Acute Rehabilitation Center being close by was a tremendous help. My wife and daughter were able to have dinner with me every day. They were comfortable there and even got to know some of the other patients.” This gave him the motivation he needed to get through the strenuous hours of rehabilitative therapy. During his family’s visits, they were also able to learn important care techniques to implement when Clarence returned home. “The staff did a great job of teaching my family some things that we still do today,” he said. Now that Clarence is back at home, these family care techniques have helped him through his continued recovery. 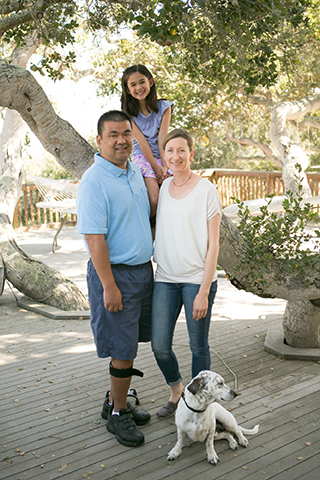 Many of the patients that are admitted to Arroyo Grande’s Acute Rehabilitation Center have lost the ability to walk, speak, feed or dress themselves, and their goal is to gain these essential abilities back. Patients receive at least three hours of therapy per day, five days per week, and stay at the facility for an average of 10 to 12 days. Impressively, over 80 percent of patients are able to return directly home for continued outpatient rehabilitation. The long-term benefit of independence has a direct positive impact on many aspects of physical and emotional health.